Happy Thanksgiving, and I hope all of you have as much to be thankful for as I do. And as these guys do. 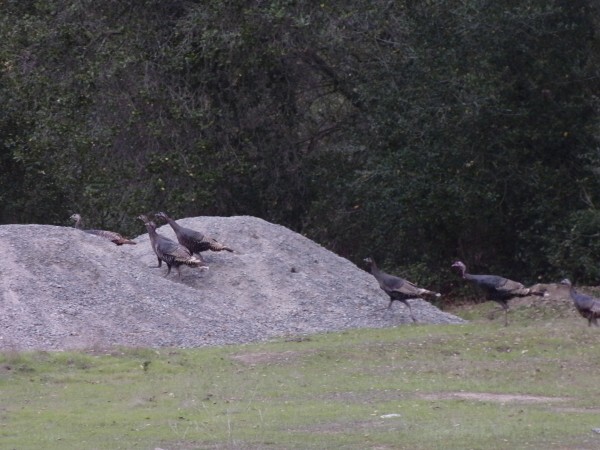 We ran into them this summer at ‘Little Yosemite’ (a park in the East Bay). 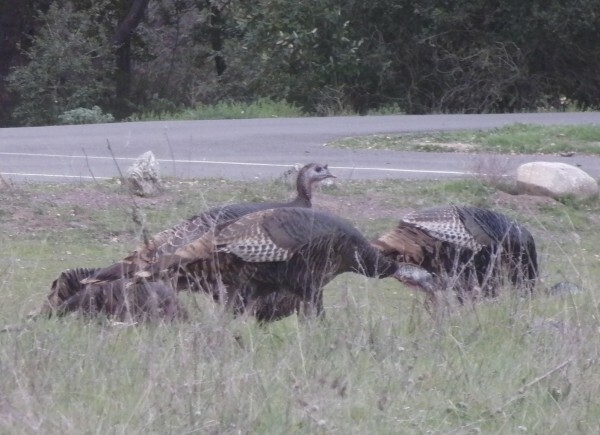 No hunting in State Parks, so these guys don’t have to worry about ending up as someone’s Thanksgiving meal. And then they noticed us and they ran away fast. I predict that they have a long future ahead of them, even if they do look kind of delicious. This entry was posted in Wildlife Pics and tagged East Bay, Turkey. Bookmark the permalink. I learned in graduate school that the turkey is named for the country Turkey. The idea was that God surely wouldn’t have given something so delicious to those pagans living in the New World; these birds must have been something un-rediscovered when Noah’s Ark hit land, something forgotten in the ancient world.